Translation of article in Dutch in Kartografisch Tijdschrift, 1986, nr. 3 by F. J. Ormeling Sr.
Eduard Imhof was born on 25 January 1895 in Schiers, at the foot of the Ratikon in the centre of the impressive mountainous region of the Swiss Canton of Graubünden (Grisons). He was fortunate that he was born and grew up in a country that was not split by political polarisation, revolution or war, something exceptional for any European during the first half of the Twentieth Century, and so he was able to develop his talents without hindrance. Events during his youth in Graubünden had a considerable influence on his career, if not determining it. His father, a geography teacher, ranked as one of the foremost authorities on the surrounding Bündner Mountains. Commissioned by the Swiss Alpine Club (SAC), he compiled travel guides for mountain tourists, guides which demanded careful field survey. Son Eduard, who appeared to possess an exceptional talent for drawing, was fascinated by his father’s work, and took part in his mountain expeditions from childhood, through which he became familiar with the then current 1:50 000 Siegfried map as well as with its imperfections. Sketch book and drawing materials became inseparable companions of the young mountain climber who, as a high school scholar from Zürich and later, as an undergraduate, helped Imhof Sr. with drawing. Following his father’s death, he even edited the SAC guide for the Ratikon mountain chain himself (1936). The thoroughness with which he worked is evident from the fact that he discovered 14 different routes for climbing the Schesaplana (2985 m.), the highest peak of the Ratikon, all of which were drawn in on a sketch map of that massif. The pinnacle of Imhof’s career as an alpinist was formed during his years as an undergraduate. His operating range extended far outside Graubünden, way into the Bernese Oberland and Valais. Sometimes alone, sometimes with friends, he was away for weeks at a time, while Imhof Sr. took care of provisioning, supplies being left at previously agreed locations. After becoming established as a professor and as a family man, the opportunities for mountain expeditions decreased. However, during official tours of duty and representative trips abroad, the passion of youth was re-kindled. In Turkey, where he was an advisor to the Topographical Survey, he climbed Mount Ararat. A cartographic conference in Chicago gave him the opportunity to travel through the Rocky Mountains. In China, he mapped the region of the Minya Konka (7590 m.). From Stockholm, where he was attending a geographers’ conference, he climbed Norway’s highest mountain, the Galdhoppig. An awe-inspiring collection of water colours, sketches and lithographs, demonstrate the artistic spin-off effect of his mountain trips. On the occasion of his 90th birthday, 1985, the SAC, an organisation within which he held office on several committees, and which had installed him as an honorary member, held an exhibition comprising 60 examples of his work in the Art Gallery of Steffisburg, nearby Thun. During the memorial service on 2 May 1986, in the Evangelical Church at Erlenbach, hometown of the deceased, the President of the SAC delivered the last honours. Undoubtably, it must have been difficult for high school pupil Imhof to choose which field of study to follow: the academy of art or engineering. His art teacher was of the opinion that his terrain sketches were “too topographical, too scientific, insufficiently artistically minded”. His later teacher of topography, Professor Fridlin Becker, whom he worshipped, considered his sketches as “too artistic, insufficiently topographic”. Finally, the decision was made in favour of studying geodesy at the Federal Institute of Technology (ETH) in Zürich, and it will not be surprising that, partly under the influence of Professor Becker, himself a zealous promoter of relief representation, he specialised in mountain topography and cartography, a subject in which he found it possible to direct his talents towards a single goal. Further, studying at the ETH provided him with an extremely useful basic knowledge of geography, which, in later years as an atlas editor, gained so much depth that geographers regarded him as one of their own. From 1936 to 1939, he was President of the United Swiss Geographic Societies. In 1919, Imhof received his degree in engineering and was appointed as an ETH assistant, responsible for giving practical geodesy lessons to architectural, civil engineering and geodesy students. Three years later, as a result of Professor Becker having fallen ill, (he died in 1923), he was commissioned to deputise for him, taking over the full teaching load of his subject area. This was followed in 1925 by his being appointed associate professor (later turned into a full chair) in topography as well as surveying and map drawing. In that same year, with the support of the ETH, he founded the Cartographic Institute on the top floor of the Geodesy building without much fuss or ceremony, the first academic cartographic training and research institute in the world. In the beginning, this new creation, which he would head for 40 years until his retirement, spatially, did not have much flesh on the bone. Even during the early Fifties, it only had a single professor, one assistant, 3 rooms and an annual budget of 200 Swiss francs at its disposal. However, under Imhof’s leadership, the institute developed into the authoritative focal point of cartography, an institute which an increasing number of foreign colleagues visited, curious about Imhof’s success. In order to canalise this growing interest, he organised international Advanced Courses in 1957 and 1960 in cooperation with the Swiss Federal Office of Topography, in which groups of 20 persons took part, in the main, foreign cartographers holding leading positions in their own country, while the host, as head teacher, took care of the lion’s share of the lecturing. It will be obvious, that these participants ensured the worldwide spread of his name and fame. As a teacher, Imhof was held in high esteem. His successor, Professor Ernst Spiess, voicing the feelings of two generations of students during the memorial service held on 2 May 1986, praised his didactional talents. The engineers remembered his practical exercises, in which he tried to bring home the principles of orderly technical drawing, and of graphic and aesthetic clarity. The cartographers remembered how they used to work together in small groups, drawing and discussing and through the medium of maps and slides, became aware of the essence of the discipline, cartographic design: the interplay of graphic elements. Both groups of former pupils could remember ImhoFs lucid manner of speaking, his total rejection of high-flown wording, written or oral. Several of his forceful expressions are firmly etched in the memory: “Those who want to make maps have got to learn first” or “Making maps does not begin with a computer, but with sharpening the end of a pencil”. Then, of course, one remembers his didactical trickery, when he exhibited good and bad solutions side by side, or demonstrated graphic enormities, as well as his charm and ease in producing drawings of rock formations as if by magic using chalk or pencil. A review of Imhof’s whole cartographic work establishes the fact that he was intensely occupied with all aspects of cartographic design: symbolisation, generalisation, use of colour, position of text, relief representation, and so on. Starting from the principle that the core of cartography was responsible graphic presentation, he strived to achieve a system of simple symbolisation and lettering. He laid down rules for the application of geometric and figurative symbols and for the use of colour. He designed a special group of stylised symbols for those minor, and often neglected relief features such as moraines, small hills, or holes characteristic of limestone topography, that can upset the earth’s surface in such a significant manner. He made a study of the generalisation concerning different forms of human settlements, and was the first person to analyse the various aspects of cartographic lettering, for which he laid down certain rules of application. Repeatedly, he pointed out the necessity for a reasonable combination of graphic elements, to attune the content of the map to its scale – and to the needs of the user. “No map can show everything” He battled against overloading the map’s image and the degeneration of its contents (tourist information and the cattle fodder industry on one and the same map! ), the prevention of which was a geographic as well as a graphic responsibility. Using the principle “Less often means more”, he advised cartographers to delete all those items which did not make any significant contribution to the map, but only served to clutter it up. Besides this, his concern was in reaching the map user. In fact, his first major publication Gelände und Karte (1950), sponsored by the armed forces, was aimed at raising the level of observations in the field, together with the closely allied reading and interpretation of maps, an exercise which fitted the alpinist and reserve artillery man Imhof like a glove. There is no other area in which Imhof s influence had such far reaching consequences than that of relief representation. His name remains associated with that particular system which is known throughout the world as the “Swiss Manner”, a title which is not particularly popular in Switzerland itself, as the word “Manner” reeks of affectation. What we understand under the title “Swiss Manner”, is the method of relief, or hill shading using oblique illumination for the upper left-hand side, with perspective hypsometric tints. Applying this method and further enhancing it by contour lines, rock drawings – one of the most striking aspects – and minor land form symbols, Imhof created an illusion of unequalled three-dimensionality. He fiercely dismissed all other methods, such as hill shading, with vertical illumination on the principle “the steeper, the darker”. As far as altitude tinting was concerned, he dismissed all the existing colour scales which incorporated the system of “the higher, the lighter” or “the higher, the darker”, and also the much used variant running from green through light green, to yellow and brown, and on to red-brown. Similarly, he disassociated himself from the theories put forward by the Austrian cartographer Peucker, whose opinion was, that colour variations conjour up a stereoscopic effect. Imhof’s aerial perspective hypsometric tints are based upon the experience that in normal vision nearby landscape colours are brighter than those further away. Looking down from a great height, the lower regions appear to be grey-blue, the hills and middle ranges from blue-green to green and yellow-green, while the mountainous regions are yellow and light yellow, with the peaks emerging as white. The adage that “easy reading is hard writing” is, also applicable to cartography. Admirers of Imhof’s relief presentation know that his success was the result of years of experimentation. The first occasion that he applied the oblique illumination technique, was in the Twenties, on wall maps of various cantons for educational purposes. From 1932, this method was also applied to some of the maps in the Schweizerische Mittelschulatlas (Swiss High School Atlas), of which he had been editor since 1927. During the ensuing years, the method was further developed graphically. It was refined, and reproduction and printing techniques were tried out on several sorts of maps in the Mittelschulatlas which thus served as an experimental nursery. The breakthrough came in 1962. In the 13th edition, the new methods were integrally applied to all the maps, including those of small scale. Thanks to its penetrating graphic effect, this new relief presentation was well received, both in Switzerland and abroad, not only in cartographic circles, but also in the teaching profession, despite the fact that there were objections to the dark grey-blue low lands. The “Swiss Manner” added considerable weight to the image of Swiss cartography, which was already held in high esteem. In the Netherlands, the rather critical cartographer Jan Schokkenkamp, with a wealth of experience behind him, working for Shell, called the Mittelschulatlas a “beautiful piece of mapping, a masterpiece of cartographic art and reproduction techniques”. In his own country, Imhof managed to persuade the Federal Office of Topography to publish alternative versions with hill shading of the new topographic map series 1:25 000 and 1:50 000, the production of which was established upon his instigation in the 1935 Federal Mapping Act. In practice these sheets eventually proved most popular with the users. Topographical services in other countries followed this example, despite the fact that this laborious system of hill shading was often felt to be a heavy work load. In atlas cartography, the Imhofian system of relief presentation sounded the death knell for the traditional hachuring methods. One after another, publishers of atlases switched over to shading mountain slopes with oblique illumination, with varying success to be sure, as in this sector, it was also impossible to pluck talented shading artists out of the blue. 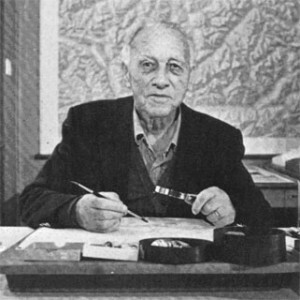 Imhof himself, who in the 1960’s was the editor responsible for the Mittelschulatlas, the Sekundarschulatlas as well as the Atlas der Schweiz (National Atlas of Switzerland), also had his hands full. In order to broaden his range, he recruited a group of promising young cartographers, taught them the new shading technique and, under his supervision, turned them loose on the various projects on hand in his studio in Erlenbach. Taking into consideration how the later careers of these shading artists blossomed, it can be established that their labour as wage earners with Imhof, was well worth their while. In 1965, as a conclusion to the operation, Imhof’s authoritative book Kartographische Geländedarstellung (Cartographic Relief Presentation) presented a theoretically warranted justification of the “Swiss Manner”, methods for its application, and a thorough analysis of all previously used methods of relief representation and altitude tinting. This work received high praise from the professional community. Representative of this eulogy, was the literary review by Dr. Fritz Holzel, the German hill shader par excellence, who wrote: “It is not a publication produced by an abstract scientist, but that of a human being, whose humour, and occasional waggish criticism, quickly brings about contact between author and reader”. As is well known, as a result of a changing viewpoint in the teaching of geography during the years 1950-1960, it became apparent that there was an increasing need for thematic maps. The Mittelschulatlas could not escape this phenomenon either. This resulted in the editor Imhof having to pay increasing attention to the taxonomy and composition of these types of maps. At that time, this was an unexplored area, but one however, with which Imhof had been brought into contact as a contributor to the Atlas zur Geschichte des Kantons Zürich, 1951 (Atlas of the History of the Canton of Zürich). It is obvious, that thematic cartography, an area in which there were few rules and, often as not, a multitude of solutions, provided fertile ground for the graphically gifted Imhof. It is evident, from the rapid growth in the thematic map section of the Mittelschulatlas, that he made full use of the chances. In the same way in which he conquered the field of relief depiction, he compiled the findings of his struggle with thematic subject matter in a book. In 1972, his third major work, Thematische Kartographie (Thematic Cartography) was published. 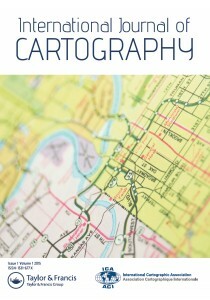 Despite the fact that it was announced as a “simple and concise textbook”, it is predominantly a personal view of the complex subject matter of thematic cartography. The author proposes that the field should be divided up according to graphic structural types, such as isoline maps, dot maps, flow maps, etc. instead of by map themes, which may be unlimited. According to Imhof, this structural approach should form the core of the science of thematic cartography, because only on this basis, is it possible to build up a clearly structured methodology. Although the book had all the allure of a pioneering work and its division into structural types was generally accepted, it was however, less enthusiastically received than Kartographische Geländedarstellung. In the periodical Kartographische Nachrichten (FRG) it was even subjected to – a cool criticism, which caused consternation among the German speaking disciples of the Grand Master. The whole range of Imhof’s graphic talents was revealed in the Atlas der Schweiz, the National Atlas of Switzerland, for which the Federal Council gave the green light in 1961, after much insistence from the master himself. At the age of 67, Imhof accepted the appointment as manager of this voluminous project, becoming Chairman of the editorial committee as well as Editor in Chief. The realisation of all this work was published in 12 instalments, spanning a period of 17 years. Upon its completion, in 1978, the National Atlas comprised approximately 500 maps based upon the latest research and statistics, together with profiles, diagrams, tables and an explanatory text in three languages. In total, approximately 140 experts from different disciplines worked on the project with whom Imhof was in close contact. According to Spiess, he led the operation with supreme authority. He succeeded in inspiring his colleagues, brought them to a “common denominator” and, when necessary, got them to bend to his will. The graphic composition and didactical presentation in all parts of the atlas betrayed the hand of the master and, as such, it became his Magnum Opus. The atlas was enthusiastically received throughout the professional world. Although it is hardly possible to make comparisons with other national atlases, each bearing its own particular stamp, the majority opinion was, that the Swiss Atlas was a world leader for its graphic composition, didactical presentation and technical cartographic quality. 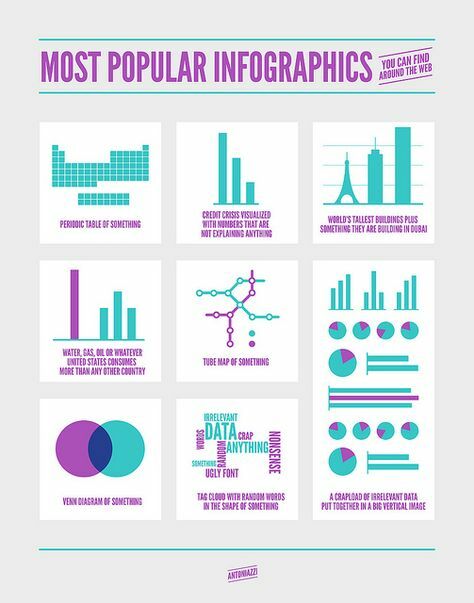 Naturally, there was criticism as well, particularly regarding the large number of analytical maps and the limited range of synthetic maps as well as the lack of problem-orientated chapters. This does not remove the fact, that during its period of publication, interest in the atlas increased to such a degree that the print run for instalments was raised from 4500 to 6000 copies. Due to his authorative international standing, Imhof was predestined to play a role in international association life. Since the mid-fifties, he took part in discussions with German and French colleagues concerning a suggestion made by the Swedish cartographer, Carl Mannerfelt, whose idea it was to found an international cartographic society, a plan which did not meet with much sympathy from geographers and photogrammetrists. Gradually, Imhof’s part in these discussions grew, and finally, he had a decisive influence. Together with Mannerfelt, he managed to persuade the sister organisations that cartographers had their own specific problem area and a right to form a separate organisation. The International Cartographic Association (ICA) was founded in Bern in 1959 with Imhof as its first president. Two years later, acting as a charming host, he presided over the first General Assembly of delegates in Paris, where the statutes of the Association were approved. In the years to come, he and Mannerfelt tactfully promoted the entry into the ICA of the Eastbloc countries. Although the Swiss are above suspicion as far as their democratic attitude is concerned, during the unsure early years of the young Association, in which swift decisions had to be taken, the first President showed sufficient authority to ensure its consolidation. At meetings the set limits he allowed for discussion – were the words “Discussion opened” and “Discussion closed” following each other in quick succession – will remain firmly imprinted in the memory. In appreciation of his pioneering work, the ICA awarded its first president with their highest distinction, the Mannerfelt medal. The author was privileged to pay the final honours to the deceased on behalf of the ICA during the funeral service held at Erlenbach. The impact that Imhof has had on cartography, is based on the combination of scientific sense, artistic talent and technical proficiency, something that is rarely found in a single person. Through this combination, his horizon was broader and he had a better overview of the whole subject than most of his colleagues. In addition, these qualities were combined with a fighting spirit, often disguised by a disarmingly gentle approach, by which he was able to achieve much more for cartography then would have been possible for most others. In appreciation of his work, he was inundated with honorary memberships and distinctions, including an Honorary Doctorate bestowed by the University of Zürich, major geographic medals (David Livingstone, Martin Behaim and Alexander von Humboldt) and he was made a Freeman of Erlenbach. Some have misleadingly called Imhof the “Rembrandt of Cartography”, thereby giving the impression that map making is an artistic occupation, an indefensible idea, and one that Imhof also firmly rejected, although he liked to juggle with expressions such as “Mapping artist” and “the Beauty of Maps”. After all, art – as he put it – demands freedom of expression, a demand which maps, inexorably fixed to geometric or statistical basic data, or to standard colour symbols, could never be able to satisfy. However, it can be said that to optimise the quality of cartographic representation, it is desirable to have the assistance of a well trained, perhaps artistically minded, graphic artist at one’s disposal. Imhof could look back on a rich and fulfilling life, surrounded by friends, dedicated students and former pupils, as well as silent admirers. His robust health made it possible for him to remain active to a ripe old age. At the age of 82, he finished the Swiss Atlas; as an 85 year old, he put the finishing touches to an impressive 1:200 000 relief map of Switzerland and, shortly before his death, he wrote the article Glanz und Elend der Kartographie (Glory and misery of Cartography) that was published, posthumously, in the 1986 International Yearbook of Cartography, a publication which he initiated in 1961. It remains for us to express our gratitude for all that Imhof stood for, brought about, and passed on to us all. The best way of paying tribute to his memory, is to hand on his theories and rules to those, who are now on the threshold of the computer age and who will be able to use them to combat the limitations of electronic image formation.